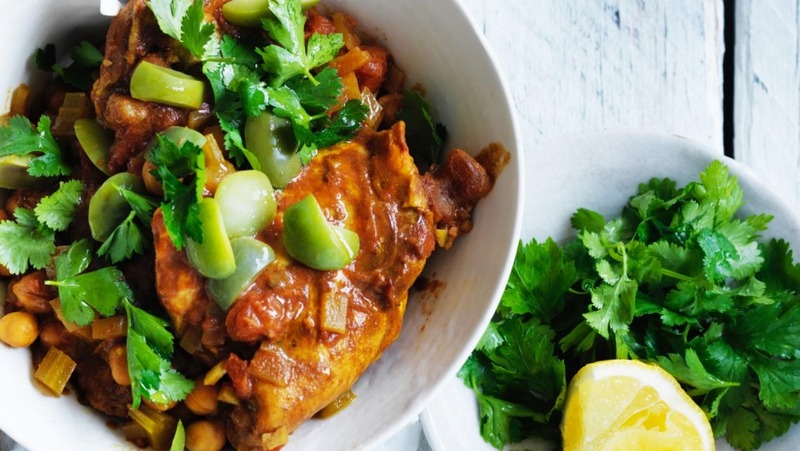 This Middle Eastern-style casserole of chicken and chickpeas is tied together by the fragrance of an array of earthy spices. 1. Combine the onion, celery, turmeric, ginger, cinnamon, saffron, tomatoes, stock, chickpeas, salt and pepper in your slow-cooker. 2. Add the chicken and cover with the lid. Cook on a low heat for 8 hours, then stir in the olives and herbs. 3. Drizzle with oil and serve with lemon wedges. Tip: If you don't have a slow-cooker, these recipes can be made in a low oven. Just use a heavy casserole dish with a lid - enamelled cast iron is perfect. A good rule of thumb is that 8-hour recipes should be cooked at 120C and overnight recipes at 100C.